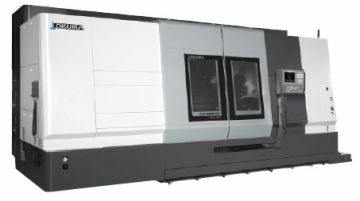 Okuma's LU7000EX is a powerful, 2-saddle CNC lathe with a wide range of spindle motor specifications to easily handle manufacturing of large parts. The LU7000EX features a large two-meter bed and high power spindles (45 kW, 55 kW, 75 kW) that provide stable heavy-duty cutting with full utilization of upper and lower turrets. Additional machining accuracy is achieved with the Thermo-Friendly Concept, which compensates for temperature changes that occur during manufacturing. Ceiling and front door shower coolant allow for complete chip removal and improved visibility. Precision threading with minimal chatter is possible with Okuma's Machining Navi T-g (threading).